Rosalie’s matching dress, legging and bib set is from Jasper Conran Junior in Debenhams. It was one of the lovely gifts we were given at Rosalie’s baby shower. This outfit is size 3 – 6 months so is getting a little small now. Would you believe my baby will be 6 months old on sunday?! Where is the time going! I’ll be sad to put it away as its been one of our favourites. The bow Rosalie is wearing is from the bow boutique. I bought it for Rosie to wear to my Nan’s 80th birthday party but then forgot to put it on. FAIL! When I dressed Rosalie this morning I knew the bow would finish this outfit off perfectly! Rosalie’s shoes were handmade by her Grandma. She is a very lucky girl and both her Grandma and great Grandma make her the most beautiful knitted and crocheted clothes. These shoesies were a commission. I asked my mum to make Rosalie some sparkly shoes to wear to my Nan’s 80th birthday party. A few weeks later these are what she produced. I love them! 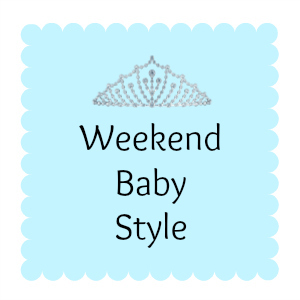 Take a look and join in with the Weekend baby style link. Feeding an Athlete – and a baby! Oh my, absolutely adorable! Babies in bows are so cute!